Explores the central role played by the galaxy in both ancient and modern times in the transformation of the human spirit. • Extends Jenkins' groundbreaking research in Maya Cosmogenesis 2012. 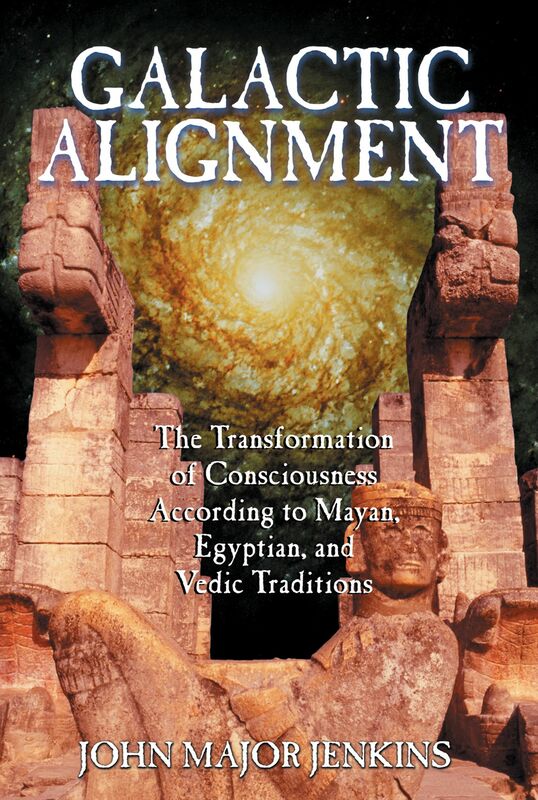 • Reveals how the coming Galactic Alignment of era-2012 promises a renewal of human consciousness. • Uncovers the galactic vision of Mayan, Egyptian, Greek, and Vedic cosmologies. The Galactic Alignment is a rare astronomical event that brings the solstice sun into alignment with the center of the Milky Way galaxy every 12,960 years. Building on the discoveries of his book Maya Cosmogenesis 2012, Jenkins demonstrates that the end-date of 2012 does not signal the end of time but rather the beginning of a new stage in the development of human consciousness. He recovers a striking common thread that connects the ancient cosmological insights of the Maya not only to Egyptian thought and Vedic philosophy but also to the diversity of humankind's metaphysical traditions ranging from Celtic sacred topography and Medieval alchemy to the Kabbalah and Islamic astrology. His work presents us with a groundbreaking synthesis of lost wisdom once common to ancient cosmologies that will help us understand the significance of this transformative cosmic milestone. The phrase ‘Galaxia Nuncias’ (message from the galaxy) follows the lead of two great pioneers, Galileo and Oliver Reiser. Galileo’s seminal work, Sidereus Nuncias (Message from the Stars) is now recognized for the paradigm-shattering breakthrough that it was, even though he died a heretic. Reiser’s work, which includes his unpublished book Messages To and From the Galaxy, has yet to be recognized as such. Perhaps someday it will. I will confess that sometimes I feel a deep kinship with these thinkers, along with Johannes Kepler, because the discoveries and concepts I write about are also unpopular, even heretical, to the establishment paradigm. However, let us pursue the analogy. Galileo’s revolutionary discovery was that all things do not revolve around the earth and a higher center, the sun, must be recognized. Likewise, my work has sought to break the bubble again, so that we might recognize an even higher center, the Galactic Center, and integrate it into conventional thought as a fundamental player in the affairs of earth. And like Galileo, my work is really just a reintroduction, a rediscovery, of perspectives that were espoused thousands of years ago by ancient metaphysicians and cosmologists who we are just beginning to understand. Galactic Alignment: The Transformation of Consciousness According to Mayan, Egyptian, and Vedic Traditions is perhaps more ambitious than I intended it to be. I wanted to simply assemble and present all the evidence I was uncovering, evidence among ancient traditions for a particular knowledge about the galaxy and our changing orientation to it over vast periods of time. In the process of tracking down the underlying meaning of often fragmented ancient systems of belief, new ideas and connections emerged that were worth exploring. This is not to say that the main thread of the book unravels, because there is one concern retained throughout, a singular pursuit that follows upon the discoveries in my book Maya Cosmogenesis 2012. In that book, I identified the rare alignment of the December solstice sun with the Galactic Center as the reason why the Maya chose to end their 13-baktun calendar on December 21, 2012. This is a complicated topic that nevertheless must serve as a foundation for everything in this new book, so I thought it necessary to summarize those findings and address my critics. Thus, Part 1 is dedicated to that purpose, as well as to sharing some new discoveries in my reconstruction of the galactic parameters of Mayan cosmology. And then we are ready to pose the questions: Did other ancient civilizations know, as the Maya did, about the Galactic Center? Did they know about our impending alignment to it, as encoded into the 2012 end-date? If so, what did these other traditions have to say about it? And so we embark on a round-the-world journey, an adventure of ideas on the cutting edge of new paradigm thinking. We explore sacred topography in Greece and England, esoteric astronomy in Homer's Iliad, the symbolism of obelisks in France, alchemy, kabbalah, Gothic architecture, Islamic astrology, Egypt’s wonders, and finally arrive in ancient Vedic India to examine the doctrine of the Yugas (World Ages) as found in the Laws of Manu. In all of these traditions, I identify important concepts, some buried but others overt, relating to a widespread recognition that alignments to the galaxy do periodically occur and that these alignments offer spiritual renewal for humanity. Always wanting to identify the precedent for my interpretations in the works of others, to show the continuity and development of my reconstruction, I explore the Traditionalist school, including the writings of esteemed scholar Ananda Coomaraswamy and symbolist philosopher René Guénon. These writers pioneered the resurrection of the Primordial Tradition, or Perennial Philosophy, made popular by Aldous Huxley and Huston Smith, and a major idea in this school is that the current cycle of history is ending amidst a proliferation of inverted spiritual values and rampant materialism--we are approaching the end of Kali Yuga. In the Vedic doctrine of World Ages, Kali Yuga is the final age, the age of greatest spiritual darkness, and its end signals the shift to a new World Age. Clarifying some undeveloped areas within Traditionalist thought, and drawing from the insights of various Vedic commentators, I identify the galactic alignment of era-2012 as the key to the timing of this transition, anchoring the Vedic yuga doctrine to a real astronomical event. Finally, a model of how the cycles of time map onto the globe and manifest as a westward flow of civilization is discussed, bringing us to explore esoteric mysteries in the Americas, including the Masonic origins of Washington D.C.’s layout and the ley-line grid over the early Maya site of Izapa--the site that invented the Long Count calendar that gives us the famous 2012 end-date. And in all of this, the uniting thread that reemerges at various points, like the full moon from behind clouds, is the archetype of the Great Mother: Isis. We find her, of course, in the Mayan material, as the womb of the Milky Way from which the solstice sun god is reborn at the end of the age. She is also in the Vedic material, the Finnish Kalevala, Egyptian cosmology, in Masonic symbolism, Peruvian mythology and even in Spanish colonial architecture. How far back into history she goes is one of the great unsolved mysteries. As the ultimate source and center of all life, her true domain is, of course, beyond time and space, but I think we can now say with confidence exactly where her throne is in the sky. John Major Jenkins (1964-2017) was a leading independent researcher on ancient Mesoamerican cosmology. He authored five books on the Maya, including Maya Cosmogenesis 2012, Galactic Alignment, and Pyramid of Fire. He gave presentations at the prestigious Institute of Maya Studies in Miami, and in 1998, he was invited by the Indigenous Council of the Americas to speak at their conference in Merida, Mexico. He was featured on two episodes of the "Places of Mystery" TV show on Discovery Channel and appeared in the film Manifesting the Mind and the documentary 2012: Science or Superstition. "Archeoastronomy, art, and ancient gnosis from world traditions break through the limits of the zodiac to embrace the Galactic Center in a rediscovered vision of evolutionary cosmology. Extensive and intriguing research." "John Major Jenkins is the most global and erudite voice of a swelling chorus of Galactic Center theorists. By framing the subject in the context of the Primordial Tradition, he raises it to a new level of seriousness, and of reassurance." "Galactic Alignment brings us full circle, into the re-membering and re-cognition of the celestial/terrestrial wisdom of our own ancient origins--re-connecting us with 'whole' consciousness, and initiating us into the 'mystery of mysteries.' A profound work of epochal importance for our historic moment. " "John Major Jenkins' scholarship is truly commendable because of his insightful penetration into the heart of an ancient wisdom on its own terms. At this critical crossroads of our destiny, this book will encourage students of cosmology to discover how the same cosmic harmony that inspired the Ancients is as relevant today as it was in our planet's deep past. More than ever we need an inspiring vision that is integrating and universal. This book offers insights into just such a vision." "This book is a fascinating and scholarly exploration of ancient cosmologies, which focuses on the relationships between the spiritual destiny of mankind and the solstitial position of the sun and the centre of our galaxy. Basing himself on a number of eminent authorities, John Major Jenkins describes a cosmic clock which provides critical end-points in the process of world-cycles. Jenkins makes us aware of the huge scale of the esoteric knowledge of antiquity, and he sets out to restore what has been lost, which is a form of cosmological knowledge embracing all the levels of our complex being at once. The great changes we are witnessing today are shown to be mysteriously coordinated with cosmic movements which we wrongly thought the ancients knew little or nothing about." "Not since Hamlet's Mill drew attention to the connection between mythology and cosmology have I seen a book to equal Galactic Alignment. Jenkins' solid research and genuine insights into his material make Galactic Alignment a pleasure to read and a true treasure trove of esoteric connections and correspondences. Building on his original and groundbreaking research on the Maya, Galactic Alignment presents a sweeping look at the world's esoteric traditions in terms of a central and powerfully compelling new idea: that times of galactic alignment might also times of transformation." "John Major Jenkins has contributed to the Traditionalist School of knowledge to provide the 'alignment generation' with a galactic portal to pass through, giving all humankind an opportunity for spiritual renewal by recognizing the astounding significance of the galactic alignment of 2012. Galactic Alignment is the definitive source book for understanding the historical significance of important astronomical events, and how many cultures of the past and right up to modern times wove this astronomical information into their sacred architecture and spiritual belief systems. Jenkins has become the Paul Revere of the modern age, and the importance of the coming of the galactic alignment in 2012 should wake everyone out of their preoccupation with material pursuits." "A ground breaking synthesis of lost wisdom from ancient teachings." "Highly recommended for anyone interested in the evolution of consciousness, or those curious as to why people keep harping on about the year 2012."